Pictured to the left, a gumball shaped 15.25x10x8.25 mm / 7+ ct. Herkimer with sharp double termination points. A 7 mm double terminated bridge crystal lays perpendicular to it near one point. Clarity is fair. The 16x9x7.5 mm / 7.13 ct. has very good clarity and an elongated shape. It is complete with one sharp tip. 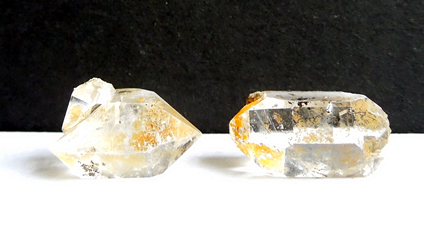 Both of these golden healer Herkimer Diamond crystals have their own personality and spark an elusive color veil. The pictures represent them well.